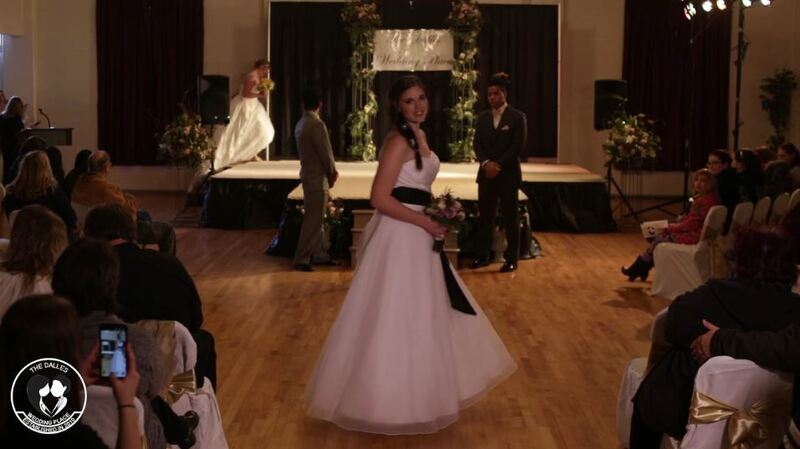 Established by Nancy Fork in 2010, The Dalles Wedding Place has offered residents of the Columbia River Gorge a local source for wedding gowns, formal dresses, tuxedos, and other supplies to create their perfect wedding day or prom night! 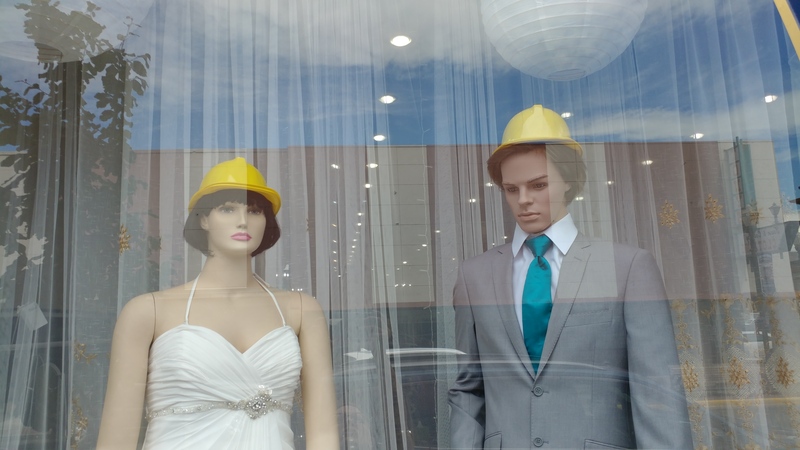 As of June 2018, The Dalles Wedding Place has downsized to allow for greater focus on tuxedos and alterations. Bridal gowns are still offered, however there is a smaller selection in-stock; we are happy to order styles chosen from our catalogs if you do not find what you like off the rack. 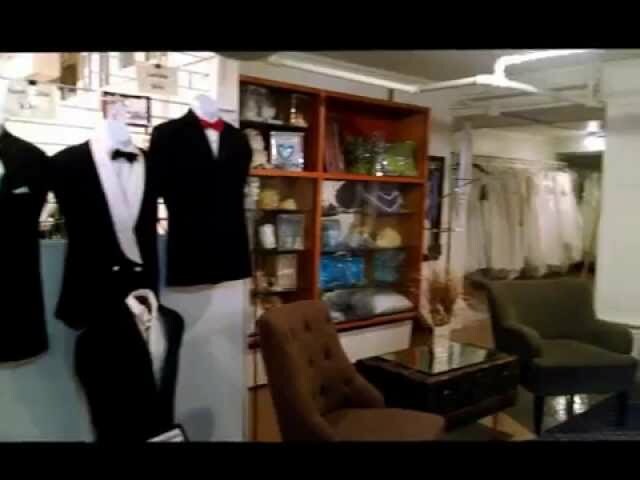 The Dalles Wedding Place is proud to feature several different in-stock Tuxedo and Suit styles to choose from. All of our packages include: Jacket, Pants, Shirt, Vest or Suspenders, Long or Bow Tie, Studs, Cuff-links, & Shoes. Mason Jars, Burlap, Hay Bale Covers, Pallet Signs, and more! Vanities, Dressers, Mirrors, Frames, Suitcases, Glassware, and more! We're one of two Oregon retailers for this designer! Rental Gowns - COMING SOON! 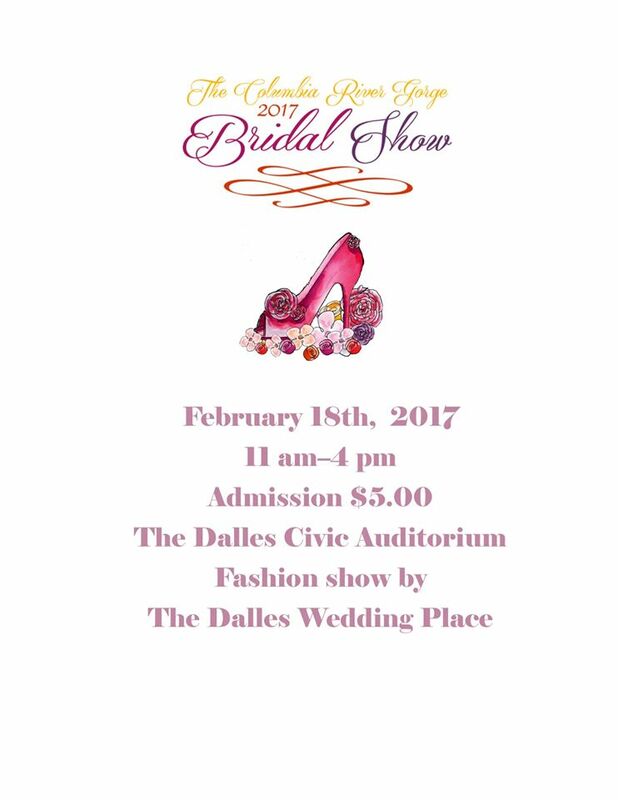 Don't want to save your dress for your daughter? Walking over to the courthouse? We'll help you find something! 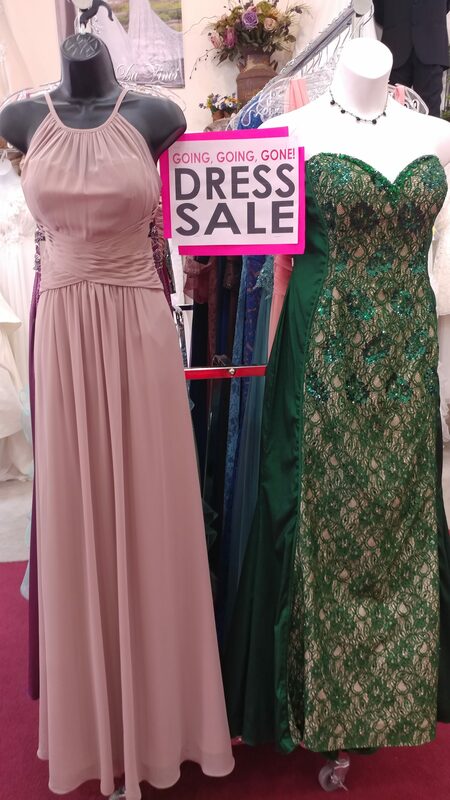 We have a small selection of vintage gowns, from the 1950s, onward! Perfectly fitted clothes gives us confidence. Let us help you to look your best every day! Whether you purchase your dress with us or online: On your wedding day, you don’t need to be worrying about your dress slipping down or stepping on the hem. Let us tailor fit your wedding dress to have you looking and feeling your absolute best when you walk down the aisle. We can change necklines, add (or remove) straps, convert dresses to skirts, modernize vintage pieces, and that’s just the start. We love a challenge! 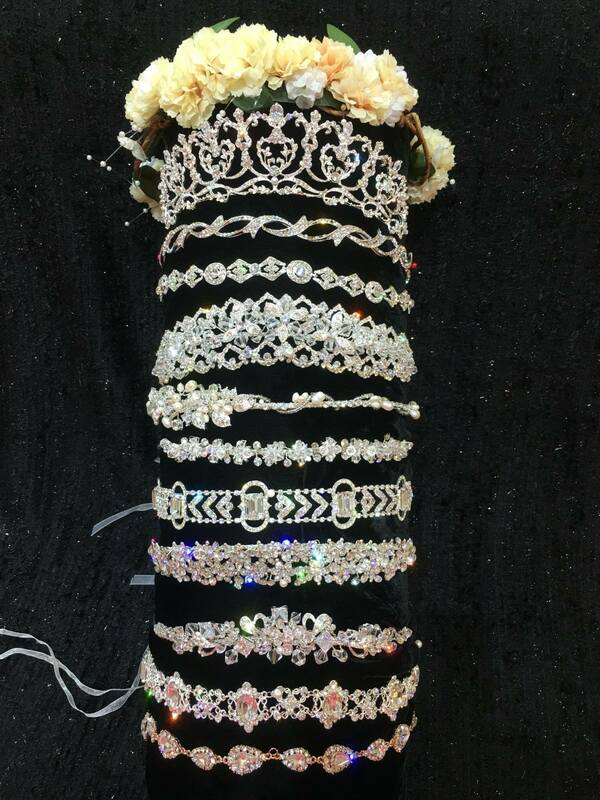 Tiaras, Necklaces, Earrings, Bracelets, and even Masquerade Masks! We can help you find something to hold you up, day or night! We’re in the business of Celebrating Life's big moments... Making others smile... Making Dreams come true! I love this place! Nancy was SUPER helpful I’d recommend this place to anyone! Nancy was always very professional and got what I needed done for my wedding even under ‘Prom Pressure! !’ She’s wonderful! Thank you! I have gotten dresses here for three years and have never been disappointed! Love this place!! Just hot the most beautiful dress!! Thank you so much Nancy for going above and beyond helping me with Madysens dress for her pageant this weekend. I can’t wait to see her in it. I will post a pic for you to see. Your the best. Mom, and I stopped by just to check out silhouettes and get an idea of what I wanted. We were there for about an hour and found the perfect dress at an amazing price! I highly recommend coming here instead of driving out to Portland or going to a bigger brand store. Nancy has a personal touch, and you can tell she really cares about you and making sure you feel perfect on your special day, whether that’s a wedding, prom, formal, or just for fun! Was very happy to get my wedding dress! Nancy was very patient with my grandma, who knows best of course! Lol can’t wait to see it when it’s ready! Went and found the perfect Winter Formal dress for Malee today. Thank you Nancy for being so helpful and kind! Thank you so much Nancy for helping me out with my prom dress. It looks amazing and I can’t wait to dance all night down in Cali with Hayden! Found a wonderful dress for my love that was beautiful:) Thank you! This store is amazing! Nancy has anything and everything you’ll need for any celebration! I’ve got all of my dresses here Nancy is so sweet and nice she’s helped me get my dream dresses. Stop in she’s great! For the ‘small hometown stores’ yours has the best selection BY FAR! And no, I’m not biased! Lol I’ve gotten a couple dresses from there now, an have never been disappointed – great selection of styles, colors and not to mention VERY competitive prices! Called ahead and was able to get in no problem. The service was GREAT! 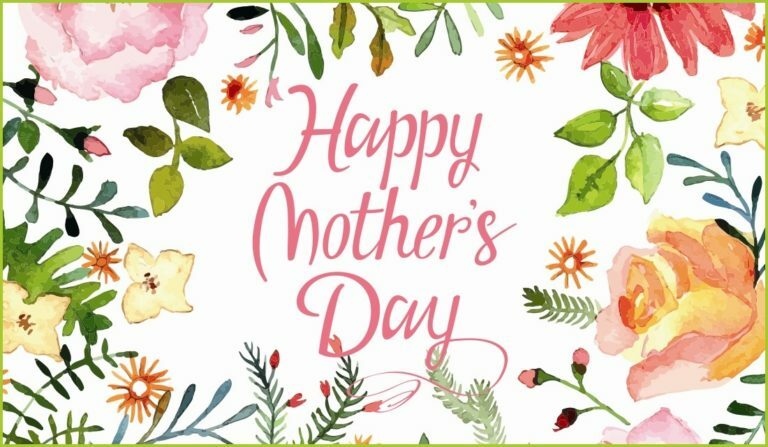 The woman here is wonderful and very patient, I felt like she was part of the family smile emoticon I’m glad I came here to look around and find the perfect dress. Look forward to coming in again! Amanda and Nacey were very helpful in dealing with last minute changes! The customer service was on point. Definitely will be back for other events. Thank you for helping us have a great prom!